FRESH TRADE IN!!! 35K INVESTED. 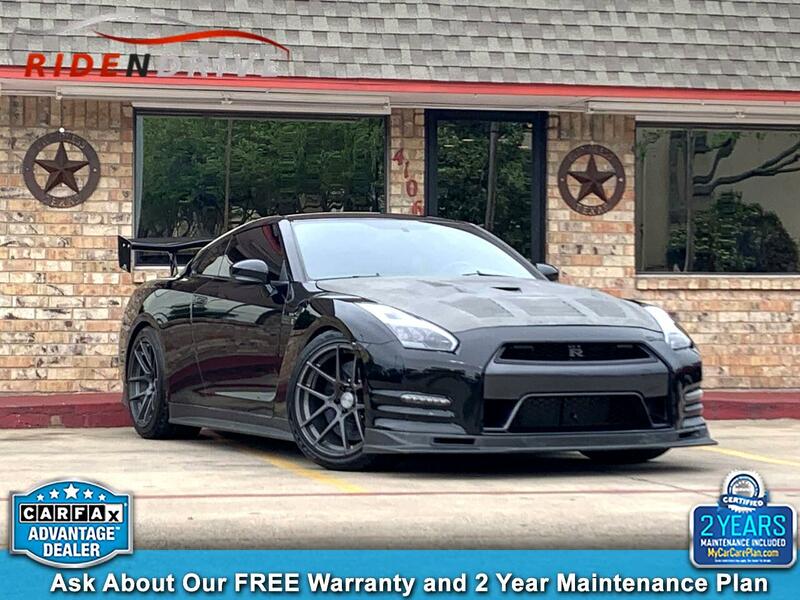 A RARE 2012 NISSAN GTR BLACK EDITION. V6 3.8 LITER TWIN TURBOCHARGED 600 HP. 6 SPEED AUTOMATIC TRANSMISSION WITH PADDLE SHIFTERS.. CLEAN CARFAX. NO ACCIDENTS. 13 SERVICE RECORDS. NAVI. FRONT & REAR BACK UP CAMERA. HEATED SEATS. BLUETOOTH/AUX CONNECTIVITY. BOSE AUDIO SYSTEM. KEY-LESS GO. PUSH START. BUILT PASSPORT RADAR SET UP (JUST NEED THE BRAIN). UPGRADED CERAMIC BRAKES WITH STAINLESS STEEL ECUTEK ECU/TCM TUNE BU BEN LINNEY. BRAKE LINES. BOOST LOGIC 4 INCH EXHAUST SYSTEM. BUSHUR RACING FRONT MOUNT INTERCOOLER. GOT BOOST INTERCOOLER PIPING WITH TIAL BLOW-OFF VALVES. TWO OIL CATCH CANS. GTC 72MM THROTTLE BODY. ASNU 330 LPH FUEL PUMPS. ID 1000 INJECTORS/ FLEX FUEL KIT. AMS RACE COOLING KIT & TRANS COOLER. SWIFT SPRINGS WITH REAR STABILIZER BARS. TWO TONE LEATHER WRAPPED RECARO SEATS. DIFLOW REAR DIFFUSER. TRUE CARBON FIBER SIEBON HOOD & TRUNK LID. RS CARBON FIBER FRONT LIP. APR REAR CARBON FIBER WING. 20 INCH ADV 20X 11 FRONT & 20X12 IN THE REARS WRAPPED IN BRAND NEW NITTO NT555 TIRES. ***ASK ABOUT OUR FREE SHIPPING***. FREE 3 MONTH SUBSCRIPTION OF SIRIUS XM RADIO. ASK ABOUT OUR FREE 2 YEAR MAINTENANCE PLAN INCLUDED!! VALUED AT $1500. ASK A SALES ASSOCIATE FOR DETAILS (ONLY ON QUALIFYING VEHICLES).